So I stumbled upon this today from the good folks over at GP Adventures LLC. This is a nifty little eighteen page adventure turns all of the usual underworld and wildness assumptions on their collective ears. This is a very interesting little piece of adventuring and its a rather interesting challenge. 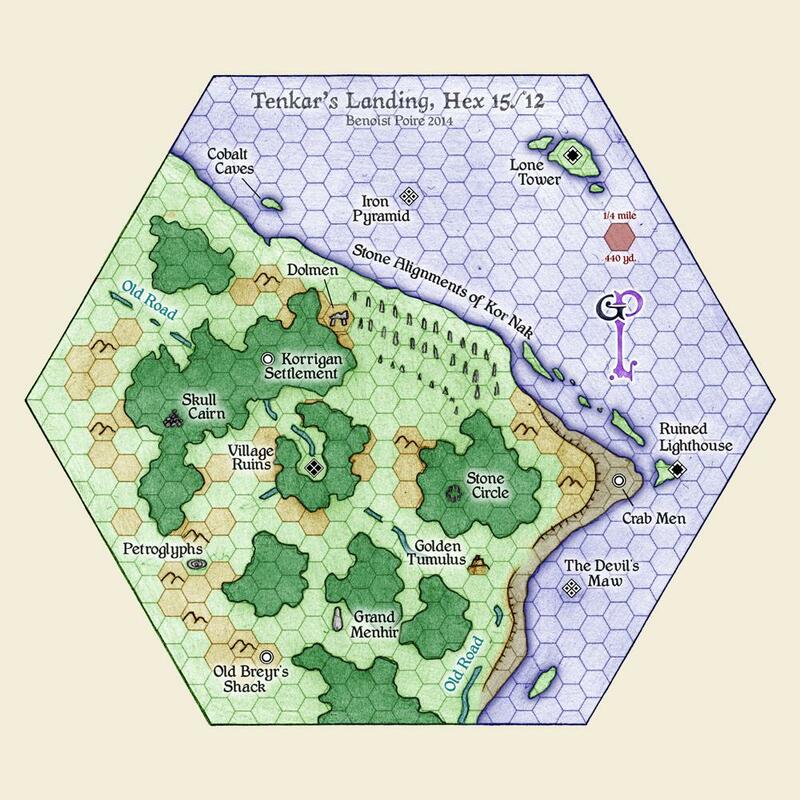 Get access to GP's completed draft for Hex 15/12 of Tenkar's Landing, the crowd sourced fantasy game setting sponsored by Tenkar's Tavern, along with the high resolution maps. This adventure is a nice piece of old school design ethos with some rather clever bits of slight of hand design that make this adventure a challenge for a party of 4th level or better characters. I'd say stick with fourth and above. There is some serious and dangerous opposition in this one. I've been quietly following this particular little adventure's development for the past couple of months and its nice to see how this one turned out. The writing is well done, the ideas interesting, fresh, and the module gets down to business fast. This is quick hex with some might well done twists and turns to it. The maps are very well done and you could spend quite a bit of time exploring it with a nice amount of custom work perfectly suited for your own old school DMing style with plenty of room to grow this one into a nice campaign cluster hex with room for expansion. The maps are well done in an old school style and I love the home made style touches with this adventure. This one is nice for download and extended play. There's a nice fresh vibe about this adventure and plenty of play to be had with this one. This module has down right interesting twists and turns to it. There are details and adventure hooks through out and a feeling of greater challenges lurking around the corners for the PC's. The details here are well thought out and hooks nicely done in a non rail road sort of way. Do I think that this free adventure is worth the download? Yes in a word I do with plenty of expansion into a fully realized game night's entertainment with room for growth. This is a free piece of old school adventure awesomeness with a good but lethal slant. The writers care about the material, know their world and know the players and DM who are going to run this one. Grab it now and get working on customizing this old school adventure into your retroclone system or original D&D style games today. A very worthy free down to add to your arsenal.